Klein was a camera maker in Rome in the 1950s, which made a short series of simple 35 mm cameras. According to notes at 'Mistermondo.com', the last of the cameras was manufactured by Ottica Meccanica di Roma (perhaps a new name for the same company). The first camera, simply named Klein was made in 1951. The camera makes 24x36 mm images on 35 mm film, which is wound from one cassette to another (like Agfa's Rapid system). It has an unidentified 5 cm lens on a collapsible lens tube, with front-element focusing down to about one metre. There is an 'I' and 'B' ('P'; 'pose') shutter, and no aperture adjustment. The example of the Klein illustrated at the 'Mistermondo.com' site has a PC socket and a cold shoe, but another, shown in a contemporary advertisement, lacks both. The notes on the site state that the improved Klein with flash synchronisation was introduced in 1954 The film is advanced with a winding knob, and there is a frame counter on the top plate. The camera has a small reverse-Galilean viewfinder. The top plate is engraved 'Klein'. The second model, the KII (from 1957 according to the notes at 'Mistermondo.com',, or 1953 according to the auctioneer's notes at Westlicht) is similarly styled, but considerably better specified. It has apertures f/9, f/16 and f/22, and shutter speeds 1/25 - 1/100 second, plus 'B'. This model takes standard 35 mm cassettes, and so has a rewind knob. The frame counter is differently-styled than the one on the original model. The top plate is engraved 'KII'. The notes at 'Mistermondo.com' state that the KII was still advertised until 1958. 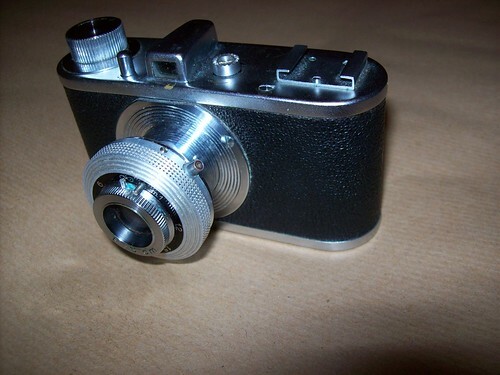 A picture is shown of a KIIa, which has a rewind knob, but no visible shutter or aperture adjustments, nor flash synchronisation (thus, essentially an adaptation of the first Klein for standard 135 film). The notes do not refer to this model; it seems likely that it preceded the KII. ↑ 1.0 1.1 1.2 1.3 1.4 Klein company history and pictures of the Klein, Klein II and IIa at Dario Mondonico's Mistermondo.com; text in Italian. ↑ Klein KII offered at the 21st Westlicht Photographica Auction, on 23 May 2012. This page was last edited on 16 June 2015, at 00:55.